At the August 26th, 2006 meting the Channel Islands Woodturners hosted Stuart Batty for an all day teaching demonstration. 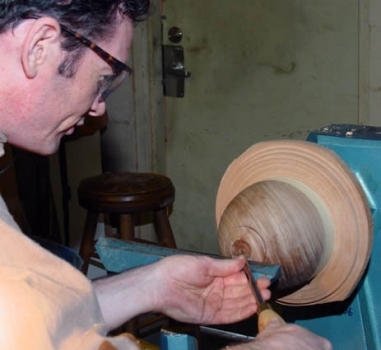 Stuart is a second-generation woodturner having begun to turn at the age of 10 under the tutelage of his father, world recognized Allan Batty. 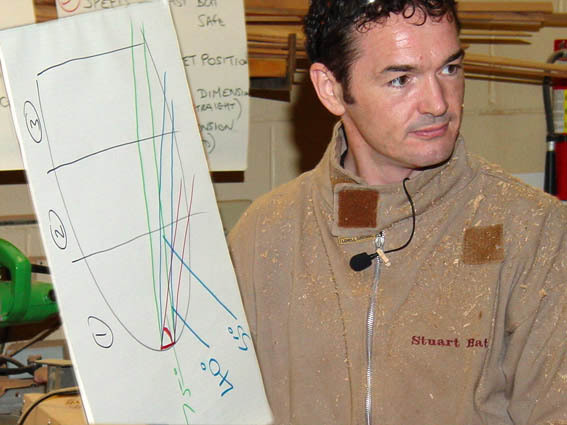 Stuart is an excellent teacher, presenting his techniques in a well-understood fashion as well as explaining the reasons behind his approach to woodturning. 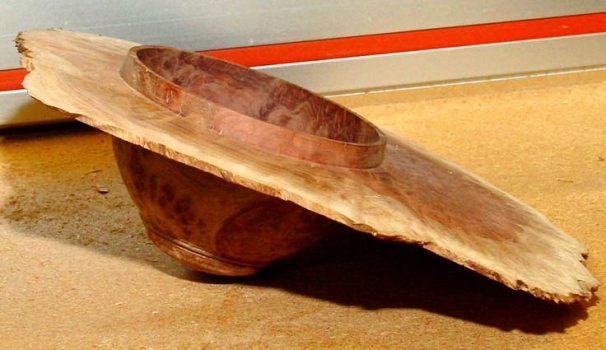 He demonstrated turning a deep small-footed bowl from wet elm, the basic spindle turning cuts in a square piece of walnut, including the pommel, bead, and cove and he turned a natural edge bowl from a piece of Australian red mallee burl. 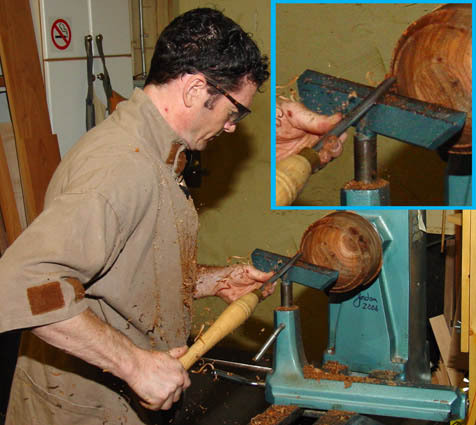 Instead of going into detail of how he turned each sample I will write about his tricks, insights and overall methodology to woodturning. 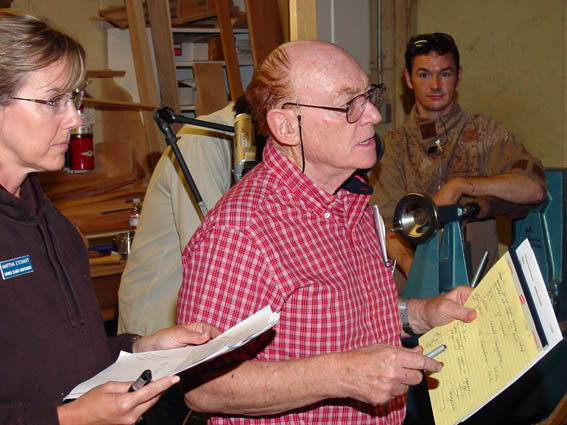 A complementary write up of Stuarts 09/04 demo with CIW along with additional photos can be found in the Demos section of this web page SBatty 2004. Stuart emphasizes the push cutting method as being the most efficient way to turn wood. This allows for very aggressive roughing cuts even on interrupted surfaces. 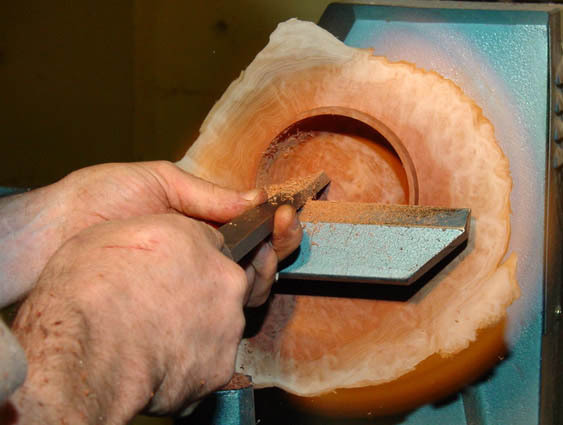 The bowl gouge works best for the push cut as it will cut twice, the wing bevel will do the heavy cutting and the tip will cut again like a finish pass. He explained that only your right hand at the end of the handle will be doing the pushing and guiding. The left hand is only to be used for adding weight to the tool on the tool rest. Never should your left hand be guiding or putting pressure onto the tool into the cut. A sharp tool will only require 2 lbs. force with the right hand to cut efficiently. Over and over Stuart emphasized, “Let the bevel float” and your tool will be near self-guiding along the contour of your piece. You will also avoid the constraints of cutting end grain and will be able to produce the best finish possible with your cutting tool. This will greatly reduce the amount of effort and time that will be needed for the sanding steps. 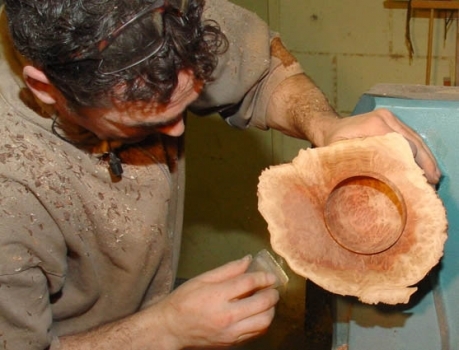 Less sanding means a better project piece as sanding mixed grain causes unevenness in the surface and the heat from sanding can cause your piece to go out of round. This is especially detrimental to projects with fitted lids. 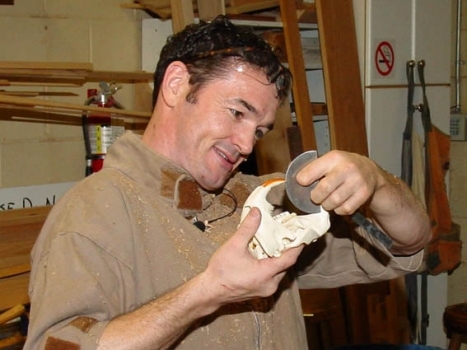 In regards to sanding he suggests never jumping more than 50% of the sanding grit; such as do not step from 100 grit to 180 or from 180 to 300 without using a 120 or 150 and 220 or 240 in-between respectively. Otherwise you can leave scratches in the surface or will be apply too much friction heat to the piece in your effort to remove the scratches. 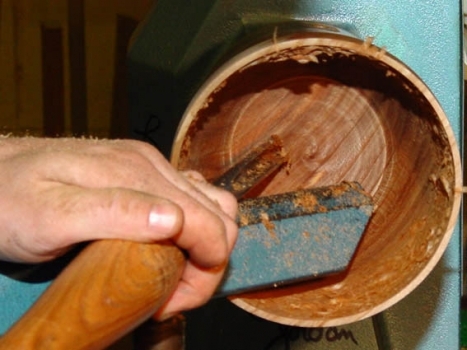 The trick to push cutting down the depth of the inside of bowls is to have an assortment of gouges with different bevel angles. Fig. 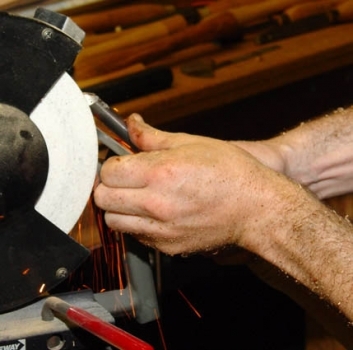 1 illustrates the changes that should be made as your tool starts to hit the lip of the bowl. 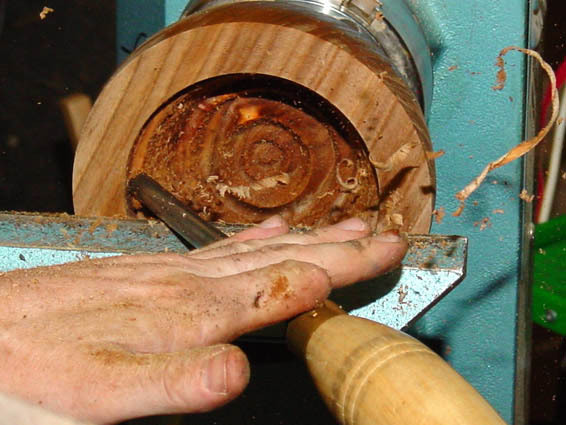 Change your bowl gouge’s bevel as you work down to the bottom in order to maintain push cutting. This will assure that you do not grab into the wood and destroy your piece. For sec. 1 use 40 °, sec. 2 use 55°, and sec. 3 use 60-70°. It will be handy to have the three different gouges as part of your tool arsenal. Negative rake scraping is an important part of Stuart’s technique. He spent a considerable amount of time illustrating its usage and benefits. The included angle of a negative rake scraper should be within 50 – 70°. 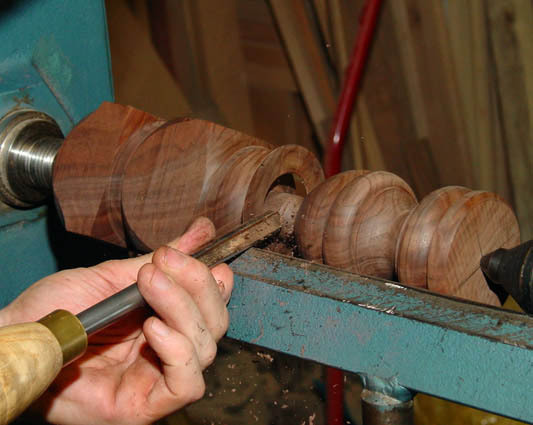 The burr on the scraper is that which cuts and will put a smooth chatter free finish on the turning. The burr is created on the cutting edge by sharpening the tool aggressively. Reference Fig. 2. This applies to all scraper shapes; flat edge, round nose, variable radius edge. He even used a chisel point beading tool as a neg rake scraper. Stuart primarily used the red mallee burl bowl to demonstrate his negative rake scraping technique. The burl had been roughed out 5 years previous. 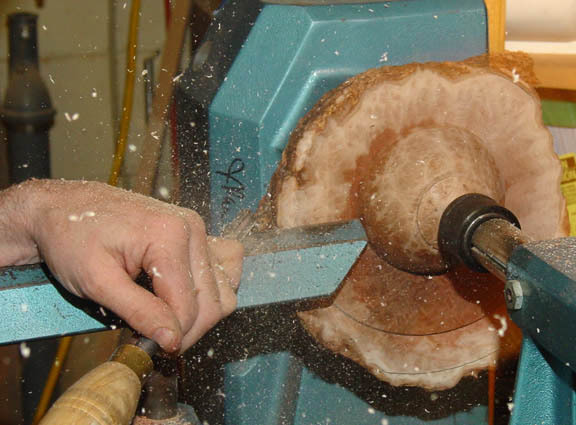 He trued up both sides of the natural edge face of the burl with a bowl gouge. 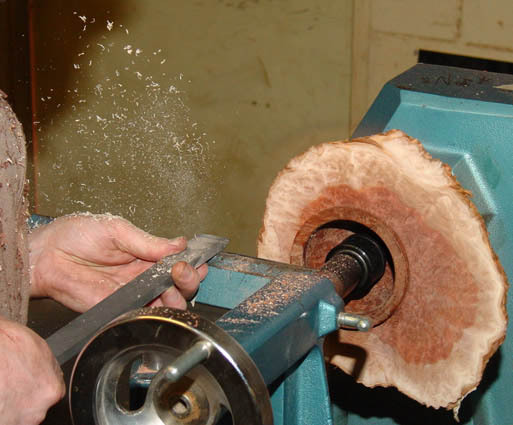 Because he was cutting against the end grain of the burl there was up to 1/16 inch deep tears in the faces caused by the bowl gouge. He used a burred flat scrapper made from 10V steel (A11-10% vanadium) to clean out the tears. This alloy holds an edge 10 times longer than the more common M2 tool steels. Even so this gave him about a minute of cutting time because in negative rake scraping only the burr is doing the cutting. The burr is so fine it breaks down rather rapidly. The tool must not be forced into the work but gently guided across the surface of the wood, he kept his arms fixed and used the tool rest and his body motion as a guide. 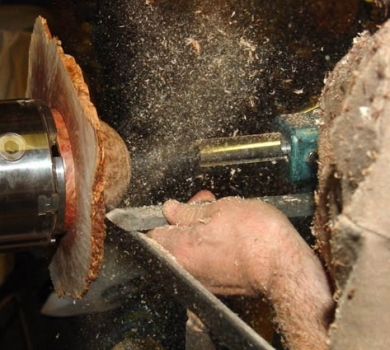 Re-sharpen as often as necessary in order to use minimal tool pressure and produce fine shavings. 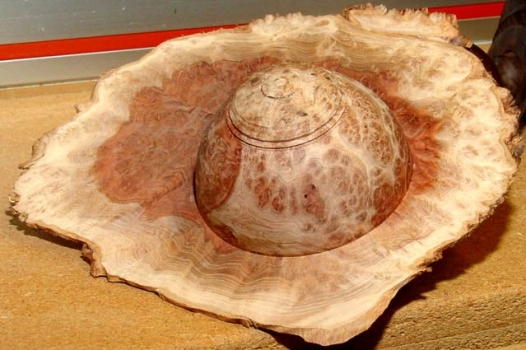 He also burred the chisel point beading tool and used it to finish the edged of the small lip and the tight corners of the burl bowl. Since this tool was made from M2 it cutting life was about 15 seconds, requiring more diligent regrinds. Let me note the A11 tool steel is very hard to come by at the present and that M4 would be a viable alternative to M2 as M4 has twice the cutting life of M2. A sanding trick that Stuart used on the interrupted cut of the burl bowl face was to wrap his sandpaper on a flexible foam block. You bend the block into a radius with the same hand pressure that is used to hold the sandpaper against the block. Gently let the block glide across the surface with light pressure. This avoided catching the sanding block and paper on the spinning interrupted edge. Craft Supplies sells this flexible foam along with their micromesh products. 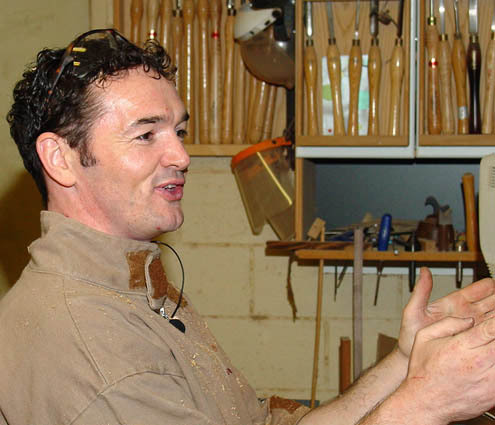 Since Stuart’s main tool that he uses is the bowl gouge he went over the grinding of these tools. 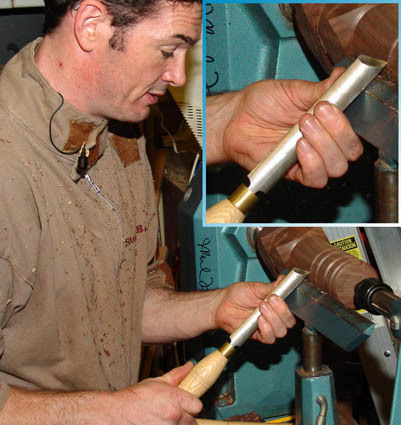 The trick in grinding a bowl gouge is that it must be done in three positions. Fig 3 illustrates the two wings and the tip position relative to the grinding wheel. 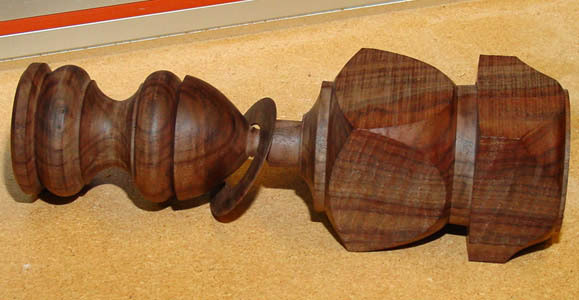 The shaded areas are the wing grind positions on the tool rest. Use a 40° +/- 2° angle on the gouge. 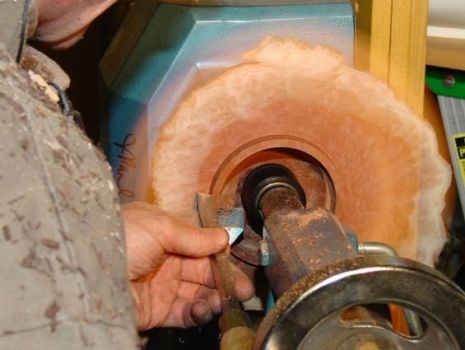 A secondary relieve grind to the bevel prevents the tool from rubbing behind the cut. He discouraged the use of grinding jigs for sharpening bowl gouges because the threefold shape of these gouges. Currently there is no jig out on the market can sharpen it’s geometry with one setup. 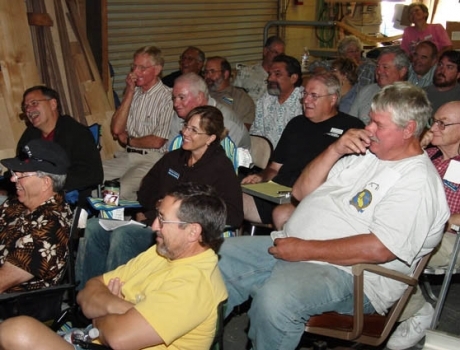 Another point he made about jig grinding was that their set up time may cause us to think twice about re sharpening our tools as often as we should therefore compromising the quality of our work with the inconvenience of jig grinding set ups. Stuart is in the process of setting up a teaching school in the L.A. area similar in scope to the one Craft Supplies has in Utah. 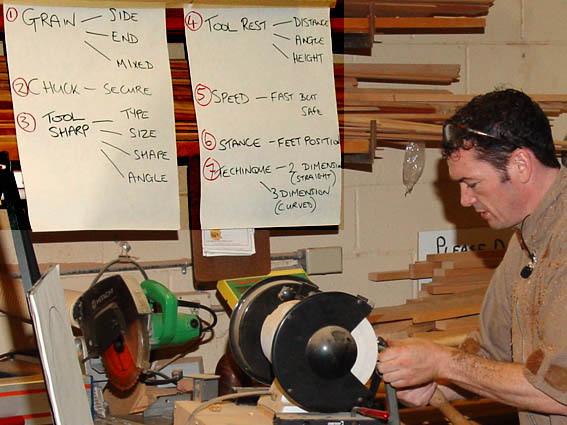 He already has the building and will be outfitted with 8 lathes. There will be weeklong classes as well as two-day classes on the weekends for the working people. His approach will be somewhat structured, he wants the students to learn and be proficient with the 13 basic cuts of woodturning before preceding on to making projects. He will notify the clubs when it is operational, in about 90 days. He can be contacted at stu@stubatty.com or by phone 213-453-2423.